As I pointed out in a previous article, the Monsanto Protection Act’s success actually proves how corporations have more power than even the United States federal government. Monsanto’s lobbyists managed to slip the rider into the major bill, which - despite the rider - has virtually nothing to do with the topic. This is a typical and routinely practiced move by lobbyists to insert an incognito line of legislation into a bill generally viewed as favorable overall. One that has proven to be effective for Monsanto. The result is now major outcry against Obama for signing the bill into law and protecting the biotech juggernaut Monsanto. Many fail to remember, however, that Obama first decided to allow Monsanto to continue pulverizing the food supply and the health of the nation back in 2008 when he went back on his promise to ‘immediately’ label GMOs. It was in 2007, during a campaign speech, that Obama first stated his support of non-GMO and GMO labeling activists, in which he promised to swiftly label GMOs. For a brief period before the bill was passed by the Senate and now signed into law by Obama, both myself and many others in the alternative news community crusaded tirelessly to alert politicians and activists in order to stop the Protection Act from going through. Unfortunately, time was not on our side. The hasty vote by the Senate and the news blackout from the mainstream media were enough to break through the warnings of concerned activists (and people who just want real food). Now, however, renewed interest in the GMO labeling campaign and the fight against Monsanto brews. With such a blatant and cocky act against the United States and its people, Monsanto has set itself up to fail. Let’s remind Obama of his promise to label GMOs he made many years ago. We’ve seen similar scenarios in the past, events in which the massive financial power of multi-national corporations is able to buy out legislators who were elected to ‘represent’ voters. But now, Monsanto has set the bar even higher. 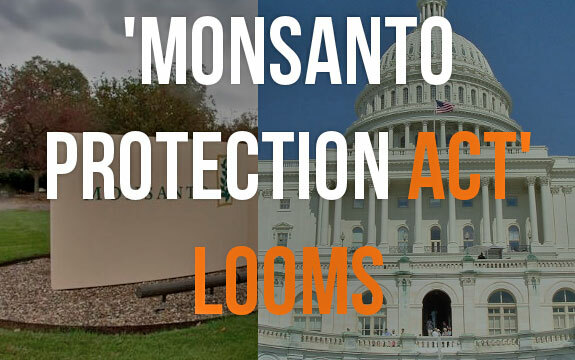 Instead of just getting a few kickbacks or avoiding USDA regulation, Monsanto lobbyists have gone as far as to generate legislative inclusions into a new bill that puts Monsanto above the federal government. 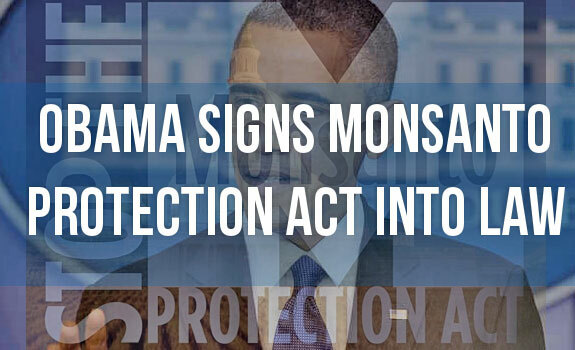 It’s called the Monsanto Protection Act among activists and concerned citizens who have been following the developments on the issue, and it consists of a legislative ‘rider’ inside (Farmer Assurance Provision, Sec. 735) a majority-wise unrelated Senate Continuing Resolution spending bill. You may already be aware of what this rider consists of, but in case not you will likely be blown away by the tenacity of Monsanto lobbyist goons. 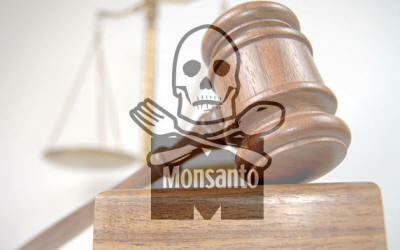 If this rider passes with the bill, which could be as early as this week, Monsanto would have complete immunity from federal courts when it comes to their ability to act against any new Monsanto GMO crops that are suspected to be endangering the public or the environment (or considered to be planted illegally by the USDA). We’re talking about courts that literally can do nothing to Monsanto if it’s found that their newest creation may be promoting cancer, for example. Whether it’s a GMO banana or an apple, Monsanto could continue planting the food abomination all it wants under court review. What really enraged Monsanto was the incident back in 2010, when a federal judge actually revoked Monsanto’s approval to plant GMO sugar beets due to environmental concerns. This is exactly what Monsanto intends to stop, literally becoming more powerful than federal courts in their conquest to monopolize the entire food chain. Monsanto has literally gotten away with murder ever since it was founded way back in 1901. Very few people actually realize the history of this company. Not many activists realize that this is the same company that was responsible, along with Dow Agrosciences, for creating Agent Orange. Created for the US military to be used during Vietnam as a ‘defoliant’ (really used for incognito chemical warfare operations which affected both allied and enemy troops), the concoction that was Agent Orange consisted of a medley of highly toxic ingredients including dioxin - a type of toxic substance considered to be one of the deadliest on the planet. Agent Orange, from Monsanto, killed 400,000 people and led to 500,000 children born with troubling birth defects. And in addition to those stats 1 million were rendered disabled or at least suffer from health issues from Agent Orange exposure. This includes US soldiers. So what happened to Monsanto after they designed a ‘defoliant’ that was actually a deadly chemical weapon that killed, maimed, and ruined lives of innocents and US soldiers? Oh, and they settled for what amounts to chump change in order to silence the dying veterans, paying 45% of the 180 million dollar payout in order to make the veterans drop the charges. Then, of course, they eventually went on to make genetically modified crops and take over 90 plus percent of the GM seed market. A market that they have actually cornered by patenting their seeds, which India calls ‘biopiracy'. Before that, they mass produced plastics that we now know are morphing the hormones of consumers. But let’s also not forget that Monsanto has so many ties inside the US government that it has managed to slip into a very comfortable position. Former Vice President for Public Policy at Monsanto, Michael Taylor ultimately became a major head the FDA. Before that, Taylor conveniently worked specifically on Monsanto’s “food and drug law” practices. Specifically in regards to Monsanto’s cloned rBGH. But remember, this was before Monsanto decided to go for a more ‘blatant’ route. Now, instead of just operating in the shadows, Monsanto is pushing a much bolder move with the Monsanto Protection Act. It not only sets a troubling precedent for Monsanto, but also for other bloated multi-national corporations that want to obtain higher authority and immunity from US courts. There truly is no rest for the wicked, and Monsanto is at war once again against health conscious consumers with the latest ‘Monsanto Protection Act‘, managing to sneak wording into the latest Senate legislation that would give them blanket immunity from any USDA action regarding the potential dangers of their genetically modified creations while under review. The USDA would be unable to act against any and all new GMO crops that were suspected to be wreaking havoc on either human health or the environment. It’s a legislative weapon that could be passed as early as next week if we don’t gather enough support to force our Senators to eliminate the section. It all started in the late hours of Monday night, when lobbyists working for the Monsanto-fronted biotechnology industry managed to slide a ‘rider’ (through the deceptively worded Farmer Assurance Provision, Sec. 735) into the Senate Continuing Resolution spending bill that is currently on the table of the Senate. Federal courts would be powerless to regulate the sale and even cultivation of illegal and dangerous GMO crops, succumbing instead to the power of the biotech industry and Monsanto. The same threat we faced last summer during the initial emergence of this act. During that time, we saw major groups assemble against the act, from national farm institutions to food safety titans. ...all came together to speak out against the incognito bombshell slipped into the 2012 Farm Bill and the 2013 Agriculture Appropriations Bill. And now Monsanto is back at it. Thus, it is imperative that we peacefully kick Monsanto out of the Senate and back into the alleyways of Washington D.C., and let it be known that any politician who sides with Big Biotech will not be staying in the Senate for much longer.